We are pleased to have been involved with the supply of timber to the Lilac Housing Scheme in Bramley near Leeds. Lilac stands for Low Impact Living Affordable Community which is currently building 20 new homes, that will be owned and lived in by a co-operative housing society. This is the first such scheme of it's kind in the UK. Straw bales and timber have been used to build the new properties which are designed around shared spaces for cooking, dining, laundry and leisure. The "super insulated" design will drastically reduce families' carbon footprints and lower energy bills. 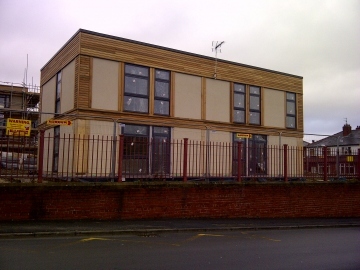 Lindum Construction based at North Hykeham in Lincolnshire are the lead contractors for the project and Bennetts Timber has supplied them with the timber for the Modcell building system and the western red cedar for the exterior cladding of the houses. It is expected that the first family's will move into the new accommodation in the early part of 2013. For more information see www.lilac.coop.